IRC is a leading international water and sanitation health (WASH) NGO based in The Hague. Sheila’s role was to rebuild their digital offering from the ground up, with a new system and complete rebuild of the architecture, visual design and user experience of their online products. She managed this major transformation and content migration project, with Damian Rafferty leading on content. Sheila wrote the requirements and business case, then recommended solutions. Having chosen the third party suppliers, she then led end-to-end scoping, design, build, testing and delivery of the new mobile-optimised website and Drupal CMS. As this was a massive cultural change for the organisation, this needed to be handled in a sensitive manner but within tight timelines. She needed to bring the internal staff on board and did so successfully. A particular challenge was the migration of over 15,000 pages of complex legacy content in five languages, often of a highly technical nature. The original website was dense, crowded and text heavy. The navigation was unfathomable requiring endless drilling down – and not necessarily taking users to the desired location. There was an absolutely massive amount of content, often of a highly technical nature and often dumped into microsites in order to have any home at all. The legacy content had grown without an overall navigation, hierarchy or architecture, with thousands of redundant, repeated or outdated pages of information. It was extremely difficult for users to find information on the website, but it was also extremely difficult for contributors to add any new content in a meaningful manner. The backend and content management system were expensive and difficult to maintain, nor were they expandable or accessible. The website was not mobile optimised or accessible. 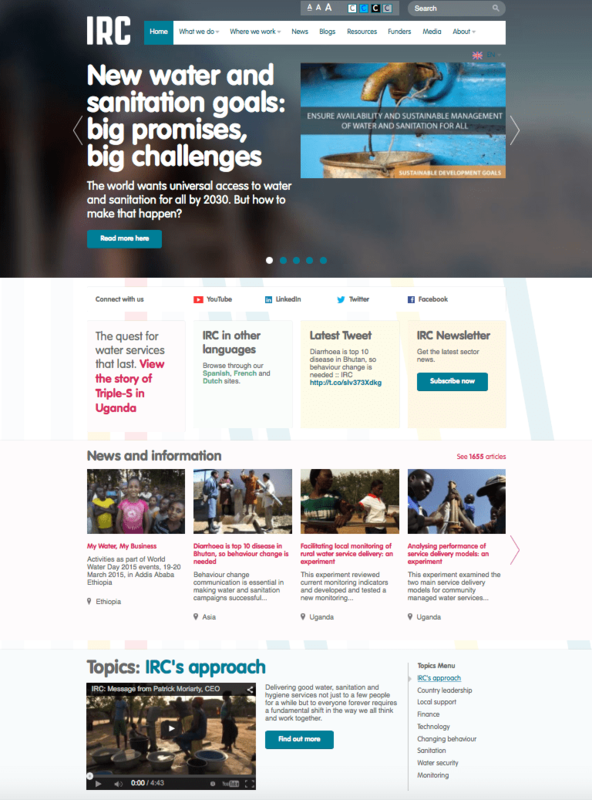 With the new website, we focussed on the content, the navigation, the information architecture and, by incorporating IRC’s new branding guidelines, we wanted to create an engaging and active experience. A new editorial approach was developed with training, guidance and documentation to ensure staff and contributors could add content with a unified approach. Existing content was audited, reviewed and heavily edited to condense it into usable formats. A new content management system (Drupal) was created and customised to be as useful and usable to content creators without high end systems or exhaustive training. The entire library of IRC resources was migrated along with the newly edited and created content. This new, mobile optimised interface offered accessibility options to ensure W3C WAIG compliance. And this is all delivered by a visually stunning and pleasing user experience and visual design.